Throughout the ages, gods have been vanishing, their mortal worshippers left in chaos. Now, Thor follows a trail of blood that threatens to consume his past, present and future. The only hope for these ravaged worlds is for Thor to unravel the gruesome mystery of the God Butcher! In the distant past, Thor follows the bloody wake of murdered gods across the depths of space. In the present, the Thunder God discovers a forgotten cave that echoes with the cries of tortured gods...and is shocked to find himself among them! And thousands of years from now, the last god-king of a ruined Asgard makes his final stand against the God Butcher's beserker legions. As three Thors from three eras race to stop the God Butcher, the full extent of his vicious scheme takes terrifying shape! This is the best thing that I've read out of Marvel Now yet. Aaron's take on Thor has the character as an actual god, full stop. The kind that answers prayers in person. And despite the lack of his regular Asgardian cast, he's still surrounded by gods and the trappings of godhood. 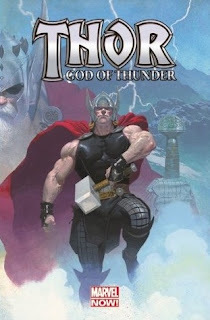 The story takes place across three periods of Thor's life: as a young, brash god not yet worthy of Mjolnir, as the heroic god who's also an Avenger, and as an older, wiser, sadder god. And he's a fascinating character in all ages, thankfully. Why the three stages in his life? Well, I wouldn't doubt that the rule of three has something to do with it, but it's also so we can see the course of the title threat across Thor's life. I have mixed feelings about this villain. On one hand, I absolutely believe that he's a credible threat. I buy him as being a threat to existence of all gods across the universe (and wow, there are a lot of gods scattered around the Marvel universe). He makes my skin crawl when he's on the panel, in a good way. That said, he's entirely lacking in motivation. I believe that he <i>could</i> destroy all gods, but I don't see any reason why he would <i>want</i> to. The few things he does say on the subject are generic and don't illuminate the subject. And he looks exactly like Voldemort, which docks a few originality points. His story isn't close to done by the end of this book, and maybe he'll get development later on. I don't know. But right now, creepy as he is, he's a villain because Reasons, and I don't like that. I also don't like that his name is Gorr. That name is bad and Aaron should feel bad about it. And maybe he does, because he very rarely uses the character's name, instead of titles like god butcher. But the villain isn't on the page much. Thor is very much the star of this book, and he's handled so well here that I ended up really liking this book despite a somewhat lacking villain.